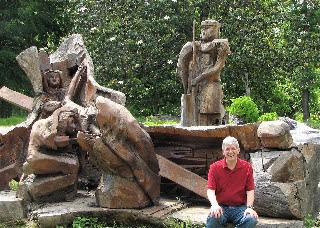 I first visited this amazing property in December of 2007 for a week long spiritual retreat. It was quite the contrast from "normal" life. Part of the day honors the Lord with contemplative silence so to say it was a peaceful place is an understatement. No radios, televisions or internet. With thousands of acres of lovely gardens, ponds, woodlands and river area, there was much to explore in the natural world. There were a couple of wood carvings done by somebody on huge fallen live oak trees. This one in the photo is when Jesus stumbled with the cross. On our way down to Florida for the retreat Randal and I had at Ellel Ministries last month, we cut off the interstate to visit Mepkin Abbey and Summerville. It was a Monday when tours are not available and the gift shop is closed, so the grounds were very empty and still. We saw an alligator in one of the ponds and another down by the Cooper River. 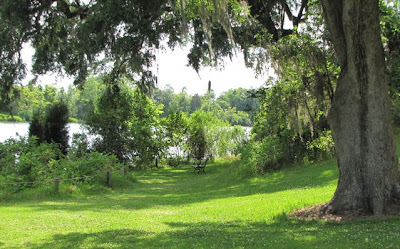 The grounds on the Cooper River is on what was once the plantation of the great Carolina statesman Henry Laurens (whose ashes are buried here), and later the home of famous publisher Henry Luce and his wife Clare Boothe Luce. The focal point of natural beauty is the Luce-commissioned Mepkin Abbey Botanical Garden, a 3,200-acre tract with a camellia garden. Mepkin Abbey’s monks are of the Order of Cistercians of the Strict Observance, more commonly known simply as Trappists. With the credo “pray and work,” the Trappists believe manual labor provides worshippers with the best opportunity to share and experience creation and restoration. They also view manual labor as following in the footsteps of the “Poor Christ” — since their work enriches and provides for the surrounding community, especially the disadvantaged. Much of the monks’ labor centers on various farm activities. For those wanting a contemplative, quiet retreat of a distinctly Christian nature, the Abbey lets you stay up to six nights in one of their guesthouses. The accommodations include a bed, desk, and reading chair, with a private bathroom. Retreatants eat together with the monks at the same time, enjoying the same strict vegetarian diet and the same strict mealtime silence. As part of their vows, Mepkin Abbey’s monks remain silent during the early and late parts of the day. The rest of their daily schedule is very strict and ordered. View photo album with pictures of both visits.